Be Your Own Detective: Be Your Own Detective - Why Not - ACORN did. Be Your Own Detective - Why Not - ACORN did. Once again ACORN pops up in the news. Now a suppossed internal investigation of ACORN shows there was a lot of no illegal activity. Hah! OK, if I am not mistaken they were caught on video telling people how to hide assets and how to run a prostitution ring. Funny, if ACORN were say, Republicans, a Conservative Organization, or Church or even a mafia family or similar, that would be considered conspiracy and organized crime. 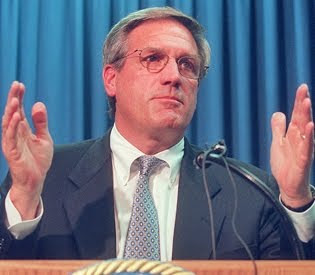 Former Massachusetts Attorney General Scott Harshbarger was commissioned by the organization to conduct the investigation. Shown here is apparently describing just how big of a lie he needs to tell to get ACORN "off the hook." An Attorney General with these findings? Makes you wonder what folks got away with in Massachusetts.